We’re onto another day without baseball as the All-Star Break comes to an end, and I’ve got another update on an offseason piece. As happenstance would have it this time around, it’s on the recently traded Jose Quintana. Back in December I wrote about Quintana’s rather distinct excellence, while also finding that there might yet be another way for him to improve: throw more front-door two-seamers. He’d gotten nearly 60% strikes when doing it in 2016. The front-door two-seamer is a thing of beauty. It’s crafty and layered. It can freeze a hitter or generate weak contact. It’s a pitch that can be equal parts aiding whiffs and abetting barrels, making it a tremendous weapon. Quintana ranked in the top 20 for lefties using front door two-seamers/sinkers in 2016, but they only made up a shade over 11% of his total pitches. Other notable southpaws, like Dallas Keuchel who ranked 6th and former teammate Chris Sale who ranked 2nd, threw them upwards of 20%. For 2017, Quintana’s throwing the front-door two-seamer less than last year but generating a nearly identical amount of soft contact as last season. That tells us he’s still keeping up with getting hitters to cut at low percentage pitches. And, given the nature of his up-and-down 2017 to date, it might also suggest an under-utilized tool is sitting there, waiting for him to take advantage of it. If Quintana is maintaining his soft contact rate from last year while throwing less sneaky pitches like front-door two-seamers, then he could add them to the mix and might be able to freeze guys more often. So why is he throwing it less this year? The short answer, via tasty Statcast pie chart, is it’s simply not performing as well. Quintana is only generating a strike on front-door two-seamers 47.6 percent of the time so far in 2017. Less success with it could be a clear reason to throw the pitch less overall, and that’s especially true when he’s generating such a similar contact profile. As Craig Edwards detailed in June, Quintana has also been giving up more homers this year than ever before. He found that there may have been some strange and unfortunate luck that contributed to a higher homer-to-flyball rate. 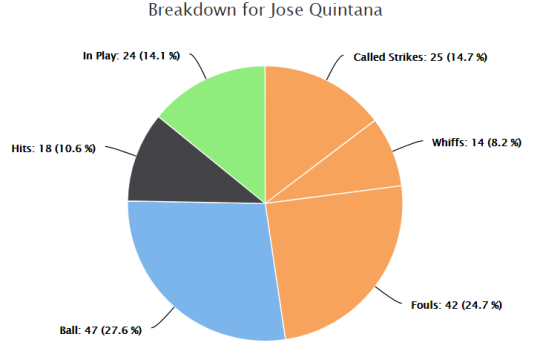 Quintana’s also giving up more walks this year than we’ve come to expect. Between more dingers and additional free passes, it’s possible he’s been less willing to throw front-door two-seamers because of how they’re designed to get takes from hitters. Maybe it’s in his head that he can’t help out a batter more than he already has been. But I wonder if the move across town will give him a shot of confidence to throw more front-door pitches that wiggle. Wrigley has been neutral to pitchers this year while Guaranteed Rate Field has favored hitters, and coming into the defending champions’ clubhouse certainly can’t hurt. With Quintana going to the Cubs, the second half of 2017 just gained a whole lot of intrigue.